Adey, W.J., Gladfelter, J.O., & Dill, R. (1977). Field guide book to the reefs and reef communities of St.
Adey, W.H. (1973). The algal ridges and coral reefs of St. Croix: their structure and Holocene development. MD: NOAA, National Undersea Research Program. canyon, St. Croix, U.S.V.I. Global Aspects of Coral Reefs: Health, Hazards, and History. Halichoeres garnoti (Pisces: Labridae). Environmental Biology of Fishes, 18, 303-308.
of the Optical Society of America. Bortone, S.A. (1978). Fish assemblages: a comparison of methods. NOAA NURP mission #78-8a. NURP mission #78-8a. Rockville, MD: NOAA National Undersea Research Program. comparison of several in situ methods. Northeast Gulf Science. mission #78-6b., Rockville, MD: NOAA, National Undersea Research Program. structural components of Tague Reef and lagoon. 12th Carribean Geological Conference, 105-109.
development and use of sweeper tentacles. Dissertation. Austin, TX: University of Texas. Ecology of Deep and Shallow Coral Reefs, Symposia Series for Undersea Research, 61-68. Meeting of the Association of Island Marine Laboratories of the Caribbean: St. Georges West. Colin, P. (1989). Aspects of the spawning western Atlantic butterflyfishes (Pisces: Chaetodontidae). Environmental Biology of Fishes 25(1-3), 131-141. Colin, P.L., Arneson, A.C., & Bonlon, Jr., R. (1978). 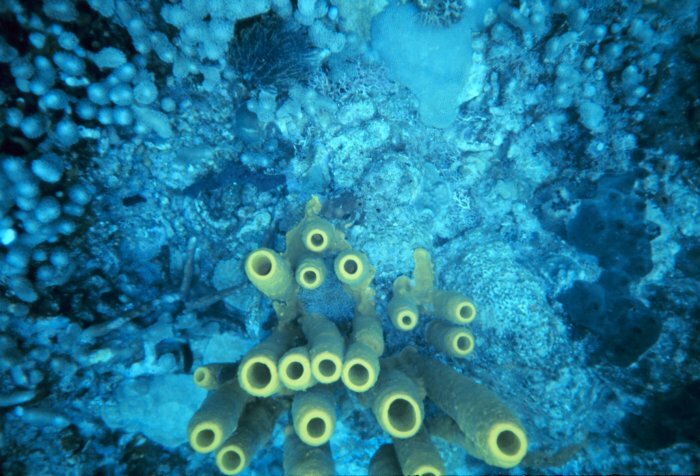 Coral distribution in the Salt River submarine canyon. NOAA NURP mission report. Rockville, MD: NOAA, National Undersea Research Program. NURP mission report 55. Rockville, MD: NOAA, National Undersea Research Program. St. Croix, Virgin Islands. The 38th Annual Gulf and Caribbean Fisheries Institute, 294-306. Dempsey, A.C., & Kitting, C.L. (1987). Characteristics of bacteria isolated from penaeid shrimp. Dennison, W.C., & Williams, S.L. (1985). Light availability and in situ growth of Caulerpa and Halophilia. The 24th Northeast Algal Symposium. facility at Salt River marina, Estate Salt River, Sugar Bay, St. Croix, United States Virgin Islands. Kingshill, St. Croix, U.S. Virgin Islands: Ecosystems, Inc.
marina, restaurant, shopping, and office complex at Estate Morningstar on Sugar Bay (Salt River), St.
decipiens . The 8th Biennial Estuarine Research Federation Meeting. minerals for inshore reef communities. Marine Ecology Progress Series, 15(1-2), 19-25. Gerhard, L.C., & Petta, T.J. (1980). Mixed carbonate and terrigenous marine environment, Sugar Bay, St.
Gill, I., & Hubbard,D.K. (1985). Subsurface sedimentology of the Miocene-Pliocene Kingshill limestone, St.
Gilnack, M.L. (1987). Deepwater coral reef algal turfs: analysis of community structure and biomass. Thesis. Gitschlag, G.R. (1981). Development and testing of underwater mark and release techniques for reef fish. NOAA NURP mission #81-14.Rockville, MD: NOAA, National Undersea Research Program. nasas comericales. Journal De Ciencias De La Academia De Ciencas De Cuba, 11, 49-60. Hanlon, R.T., & Hixon, R.F. (1980). Body patterning and field observations of Octopus burrvi Voss, 1950. Hay, M.E. (1984). Patterns of fish and urchin grazing on Caribbean coral reefs: are previous results typical? Helfman, G.S. (1983). Resin-coated fishes: a simple model technique for in situ studies of fish behavior. reproduction of the Caribbean angelfish, Holocanthus tricolor. Marine Biology, 88, 311-322. Economic Paleontologists and Mineralogists, 491-527.
geological research. Proceedings of the Sixth International Coral Reef Congress , 243-52. Hubbard, D.K. (1984). Depositional styles of periplatform sedimentation around St. Croix, U.S.V.I. Proceedings of the Annual Meeting of the Society of Economic Paleontologists and Mineralogists. end terrace system on St. Croix, U.S. Virgin Islands. 12th Carribean Geological Conference, 73-83. Hubbard, D.K. (1984). Holocene reef development at Salt River submarine canyon, St. Croix, U.S.V.I. Florida, and the International Society for Reef Studies. Miami, FL: University of Miami. Hubbard, D.K. (1989). Modern carbonate environments of St. Croix and the Caribbean: a general overview. 12th Carribean Geological Conference, 85-94. Teague Bay, St. Croix: West Indies Laboratory. Hubbard, D.K. (1989). The shelf-edge reefs of Davis and Cane Bays, Northwestern St. Croix, U.S.V.I. 12th Carribean Geological Conference, 167-179. Teague Bay, St. Croix: West Indies Laboratory. Hubbard, D.K., Burke, R.P., & Gill, I.P. (1985). 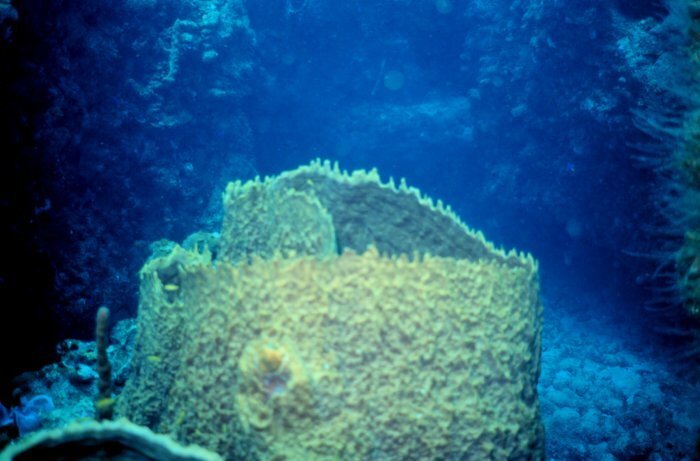 Accretion in deep shelf-edge reefs, St. Croix, U.S.V.I. River submarine canyon, St. Croix, U.S.V.I. Journal of Sedimentary Petrology, 56 ,848-861. Hubbard, D.K., Suchanek, T.H., Gill, I.P., Cowper, S.W., Odgen, J.C., Westerfield, J.R., & Bayes, J. (1982). Preliminary studies of the fate of shallow-water detritus in the basin north of St. Croix, U.S.V.I. NURP mission #80-1, NULS-1. Rockville, MD: NOAA, National Undersea Research Program. Biosphere reserve research report No. 31. St. Thomas, US Virgin Islands: Island Resources Foundation. St. Croix. NOAA NURP mission #80-11. Rockville, MD: NOAA, National Undersea Research Program. Josselyn, M.N., Cailliet, G.M., Niesen, T.M., Cowen, R., Hurley, A.C., Connor, J., & Hawes, S. (1983). of a deep water seagrass, Halophilia decipiens Ostenf. Aquatic Botany, 25, 47-61.
reef fishes in the West Indies. Journal of Experimental Marine Biology and Ecology, 78, 253-268. American Academy of Underwater Sciences 10th Annual Scientific Diving Symposium, 239-254.
seagrass meadow snail population. Contributions to Marine Science, 68 (Supplement), 227-243.
bay grasses. The American Society of Zoologists/Western Society of Naturalists. Landry, Jr., A.M. (1984). An evaluation of multilevel artificial structures in the attraction of deep reef fishes. NOAA NURP mission #84-1b. Rockville, MD: NOAA, National Undersea Research Program. Lang, J.C., Lasker, H.R., Gladfelter, E.H., Hallock, P., Jaap, W.C., Losada, F.J., & Muller, R.G. (1992). Lobel, P.S. (1981). Trophic biology of herbivorous reef fishes: Alimentary pH and digestive capabilities. Journal of Fish Biology, 19 (4), 365-397. Ecology of Deep and Shallow Coral Reefs, Symposia Series for Undersea Research, 29-38. Mateo, I. (2002). Nearshore habitats as nursery grounds for recreationally important fishes. St. Croix, U.S.
Miller, A.I. (1989). Lateral mixing and spatial resolution in molluscan assemblages of Smuggler's Cove, St. Miles, J., & Harvell, C.D. (1990). Primary productivity of Briareum asbestinum over depth clines. concept plan, environmental assessment. St. Croix, US Virgin Islands: National Park Service. Neudecker, S. (1982). Carrying capacity of chaetodontid and pomacanthid fish communities, St. Croix, U.S.
Virgin Islands. Berkeley, CA: Division of Environmental Studies, University of California, 48-72. Neudecker, S. (1982). Ecological relationships of chaetodontid and pomacanthid fishes at St. Croix. Neudecker, S., & Lobel, P.S. (1981). Mating systems of chaetodontid and pomacanthid fishes at St. Croix. Proceedings of the Fourth International Coral Reef Symposium, 588-. Neudecker, S., & Lobel, P.S. (1982). Mating systems of chaetodontid and pomacanthid fishes at St. Croix. Zeitschrift Für Tierpsychologie, 59 (4), 299-318. NOAA. (1985). Fiscal Year 1984 report. Rockville, MD: NOAA, National Undersea Research Program. NOAA. (1983). NOAA Undersea Research Program Fiscal Year 1981 report. Rockville, MD: NOAA. by Cyphoma gibbosum on gorgonian corals. Nyden, B.B. (1985). Hydrolab: NOAA's Undersea Research Program at West Indies Laboratory. Proceedings of the Fifth International Coral Reef Congress, 607-609. Ogden, J.C. (1979). Priority effects in juvenile coral reef fish recruitment. NOAA NURP mission #79-1. Fifth International Coral Reef Symposium, 79-80. Ogden, J.C., & Lobel, P.S. (1978). The role of herbivorous fishes and urchins in coral reef communities. Environmental Biology of Fishes, 3(1), 49-63.
reef zooplankton. Bulletin of the Ecological Society of America, 65, 275-276. Ohlhorst, S.L., Liddell, W.D., & Boss, S.K. (1985). Temporal patterns of migration by reef zooplankton. Olsen, D.A., Turbe, K., & Friedman, B. (1979). Optimum yields for Virgin Islands black coral fisheries. NOAA NURP mission #79-5. Rockville, MD: NOAA, National Undersea Research Program. Olson, R.R. (1986). Light-enhanced growth of the ascidian Didemnum molle/prochloron species symbiosis. Parsons, K.M. (1989). Taphonomy as an indicator of environment: Smuggler's Cove, St. Croix, U.S.V.I. 12th Carribean Geological Conference, 135-143. Teague Bay, St. Croix: West Indies Laboratory. feeding rate, and gas exchange in selected cnidarians. Dissertation. Cambridge, MA: Harvard University. American Society of Zoologists/Western Society of Naturalists . sponges. The Benthic Ecology Meeting. 104-105. Boulder, Colorado: Geological Society of America. Reaka, M.L. (ed.). (1983). The Ecology of Coral Reefs, Symposium Series for Undersea Research. Reaka, M.L. (ed.). (1985). 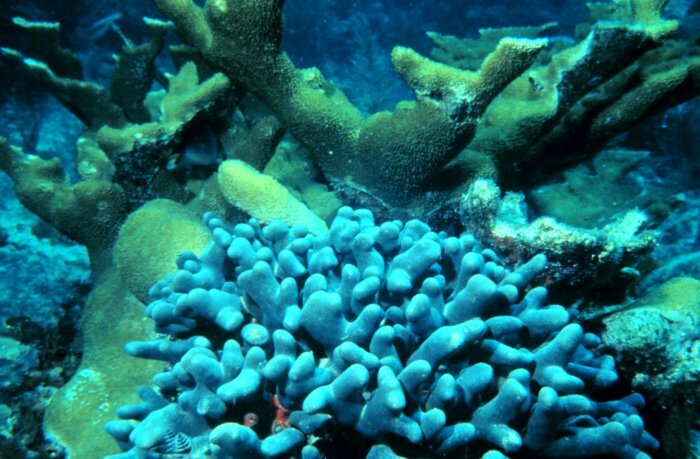 The Ecology of Coral Reefs, Symposium Series for Undersea Research. Reaka, M.L. (1983). 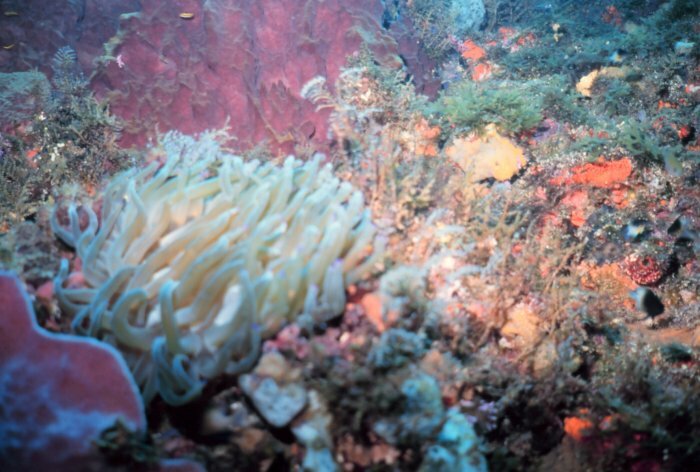 Patterns of life history and behavior in coral reef organisms along a depth gradient. ecological processes that structure fish and invertebrate reef communities. NOAA NURP mission #80-6. Risk, M.J. (1972). Fish diversity on a coral reef in the Virgin Islands. Atoll Research Bulletin, 153, 1-6. NURP mission #82-18. Rockville, MD: NOAA, National Undersea Research Program. Samson, G.G. (1981). Fish behavior in relation to commercial fish traps. NOAA NURP mission #81-2. #84-5b. Rockville, MD: NOAA, National Undersea Research Program. Smith, C.L., & Tyler, J. (1978). Regulatory mechanisms in coral reef fishes. NOAA NURP mission #78-2b. Speed, R.C. (1989). Tectonic evolution of St. Croix: implications for tectonics of Northeastern Carribean. Carribean Geological Conference, 23-35. Teague Bay, St. Croix: West Indies Laboratory. than we can chew. The Ecology of Coral Reefs, Symposia Series for Undersea Research, 103-112. Suchanek, T.H. (1985). Callianassid shrimp burrows: ecological significance of species-specific architecture. Proceedings of the Fifth International Coral Reef Congress, 205-210.
mission #84-4, 85-4. Rockville, MD: NOAA, National Undersea Research Program. Taylor, G., & Trageser, J. (1990). Directional wave and current measurements during Hurricane Hugo. Vauthrin, C.D. (1993). Legacy to treasure: Salt River Bay National Historic Park and Ecological Preserve. Virgin Islands Department of Planning and Natural Resources, Coastal Zone Management Program. (1993). damselfish territoriality. Proceedings of the Fourth International Coral Reef Symposium, 589-. Anilocra chromis Williams and Williams, on brown and blue chromis. American Zoologist, 21, 513-. Pomacentridae): a new method for studying fish-parasite relationships. NOAA NURP mission #79-4. NURP mission #83-5. Rockville, MD: NOAA, National Undersea Research Program. the Association of Island Marine Laboratories of the Caribbean, 2. Williams, S.L. (1985). National Undersea Research Program. The NOAA Undersea Research Meeting. meeting of the Association of Island Marine Laboratories of the Caribbean, 6. Caulerpa spp. (Chlorophyta) in a submarine canyon. Marine Ecology Progress Series, 21, 275-281.
cycles. NOAA NURP mission #78-8b. Rockville, MD: NOAA, National Undersea Research Program. Winkler, P., Szurley, I., & Greiner, L. (1980). In situ oxygen consumption of reef fishes during quiescence. NOAA NURP mission #80-4. Rockville, MD: NOAA, National Undersea Research Program. Undersea Research, 69-78. Rockville, MD: NOAA, National Undersea Research Program. device study conducted from Hydrolab. Bulletin of Marine Science, 37, 377-386. Bibliography compiled by Linda Pikula, NOAA Miami Regional Librarian.